Wriphe is the messy bits. If you had six gravestones and I took away four, how many would you have? Frankly, there can be no more debate. 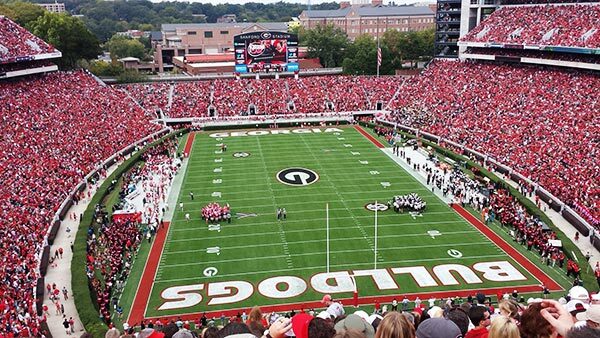 The 2016 Georgia Bulldogs are not very good. Even though I was there and watched every play, I can't tell you why exactly the Bulldogs lost to the Vanderbilt Commodores today. They ran and threw okay (offensive line is still a weakness), but couldn't get points. Special teams were as terrible as usual, if not worse, and I think that was the difference. Giving up 7 points to Vandy in the first 22 seconds (after an opening kick return to the 4 yard line) was probably more than this team could overcome. At least losing to Vanderbilt 17-16 proves that the Hail Mary loss to Tennessee wasn't as painful as it seemed at the time. 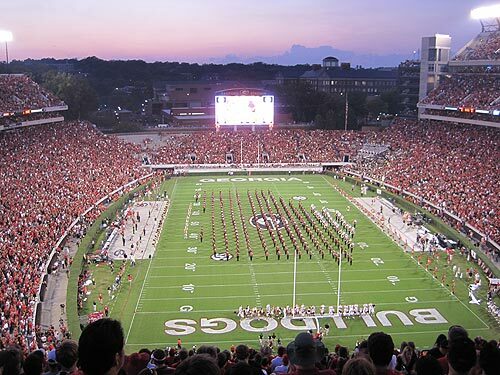 This Georgia football team will be nowhere near Atlanta when the SEC Championship Game in December, and rightfully so. If you had eight tpyos and I took away seven, how many would you have? Remember last year when Vanderbilt ended UGA's season with that last minute comeback in Nashville? Revenge accomplished. I cannot tell a lie: we left in the 3rd quarter when Vanderbilt, down by 24 points, punted on 4th and 1. If Vanderbilt was willing to give up on the game, I didn't see any need to stick around for the 17-44 final. No more home games until November, when Auburn comes to town. If the Tiger's 7-41 romp over LSU today was any indication, that's going to be a pretty good game. If you had four blog posts and I gave you six more, how many would you have? If you had five gravestones and I gave you eight more, how many would you have? I don't know if Vanderbilt came to town today with the intention of losing, but after watching them play, I can't say otherwise. They acted like they knew that they were outclassed by this Georgia team and hadn't considered any way to win. The Dores played us hard last year, but just didn't seem to have their heart in it tonight. 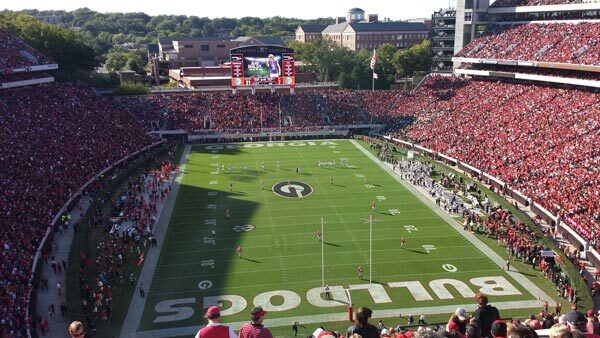 It was, quite frankly, sad to watch as UGA quickly steamed their way to a 48-3 win. Otherwise, it was a beautiful evening. The air was cool, the crowd enthusiastic and friendly. 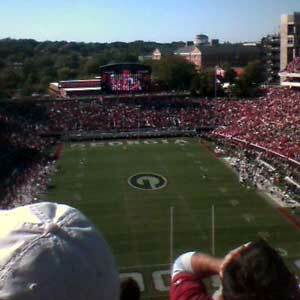 I attended the game with Dad, his first UGA game since his foot surgery last August. I enjoyed king-sized pretzel and a Coca-Cola as we heckled the Vanderbilt band ("The Spirit of Gold"). Some of our old season ticket holding seat neighbors had even returned. It was a good day for a ball game. Too bad the opponent didn't show up. If you had five trivia questions and I gave you nine more, how many would you have? 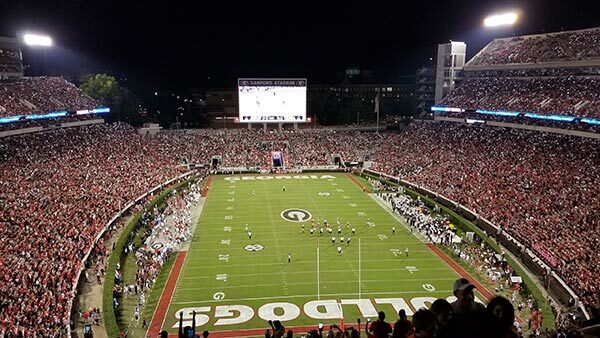 We came to Athens for the crowning of a new king, and we stayed for something that vaguely resembled football. But no one seemed too disappointed that the game wasn't competitive. 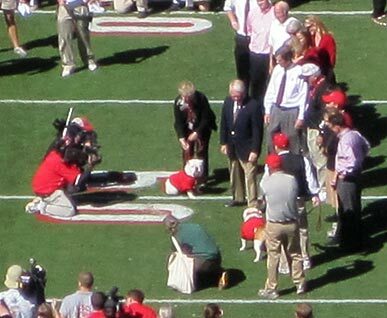 Most of the crowd, my mother included, had come to the stadium solely to see the coronation collaring ceremony for Uga VIII (nee Big Bad Bruce). Uga VIII, less than a year old, seemed a little understandably overwhelmed by the crowd, cameras, and noise. Russ, however, seemed relieved to be free of the burden of having to watch the Dawgs play any more football. 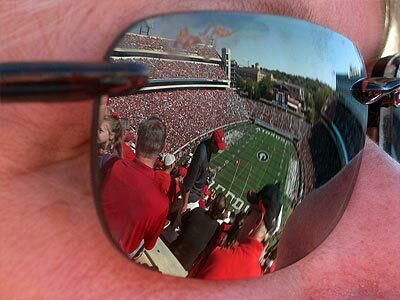 Earlier in the week, Athletic Director Greg McGarity said that Uga represents "everything we want our student-athletes and fans to be: proud, loyal, tenacious, and relentless." I can't speak for any bulldogs, but I for one am proud to recognize that three of those words are nearly synonyms for stubborn. I think I misled you because I thought I had read that Big Bad Bruce was less than a year. I have now read that he was born 9/12/09 so he is just over one year. Also, D pointed out that he got a bit confused because of the typo that he was being named UGA VII and not UGA VIII... Oh and BTW that is probably the best photo of me in years. Thanks!!! Yep, have to confirm NeNe's comments. It is UGA VIII (his name is "...Bruce" but is always called "UGA". Is there a connection with Bruces and being called different names AKA Batman? I understood that BBB was only 11 months old. Guess we were reading the same incorrect report. What do you expect from these here Savannah folk? I've updated the above to reflect the name correction. I knew better. Bad, bad Walter. If you had six dogs and I gave you eight more, how many would you have? I really enjoy Homecoming each year. Everyone is generally more pleasant and less drunk than at a typical game. And of course, the game is usually a laugher as well. While this year Vanderbilt was a little more competitive than in years past, as my brother said on the ride home, "the game wasn't as close as it seemed to be." If not for a handful of missed field goals and phantom pass interference calls, this game would have been a typical Homecoming blowout rather than the deceptively close 27-17 final score indicated. Once again, Michael Adams (receiving fewer "boos" and catcalls than in years past) presided over the Homecoming Court, the highlight of which was the Homecoming King dropping his crown and tripping over his fallen sash. I'd report his name here, but I couldn't tell you who it was if you gave me a lineup. I didn't make a note of Homecoming Court winners while I was in school, and I don't plan on starting now. 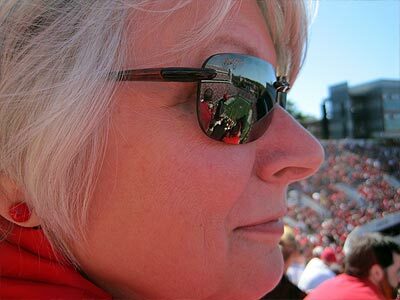 I may enjoy the spectacle, but that doesn't mean that I really care about it, you know. If you had eight video games and I took away eight, how many would you have? I said before today's game that the worst part of a potential loss to Vanderbilt would be being exposed to the world as a bad football team. And then we lost to the Commodores. The picture above was taken just after the Dores kicked the game winning field goal (leaving 2 seconds on the clock: don't get me started on how poorly refs in the NCAA have handled clock management this season). That's Vandy celebrating on the right. They hadn't beaten us in 11 years. The worst part? After the game, I realized that we have very little chance of beating Florida, Auburn, or Georgia Tech this year. That will give us, at best, a 7-5 record. Ouch. If you had nine lines of code and I took away eight, how many would you have?